"This is a very rich and flavorful beef dish with a thick, red, smoky tasting sauce. Great for making a day ahead and reheating. Instead of noodles, you can serve over rice or potatoes." Mix together paprika, salt, and pepper in a large bowl. Toss the meat cubes in the paprika mixture until evenly coated. Heat one tablespoon of the oil in the skillet over medium-high heat. Put a third of the beef cubes into the skillet and cook until nicely browned on all sides. Transfer to the slow cooker. Pour 2 tablespoons of water into the skillet and scrape the browned bits from the pan; pour liquid into the slow cooker. This prevents the paprika from burning when you brown the next batches of beef. Add another tablespoon of oil to the skillet and cook the next batch the same way; repeat for the third batch. Fill a large pot with lightly salted water and bring to a rolling boil over high heat. Stir in the egg noodles, and cook uncovered, stirring occasionally, until the noodles have cooked through, but are still firm to the bite, about 5 minutes. Drain. 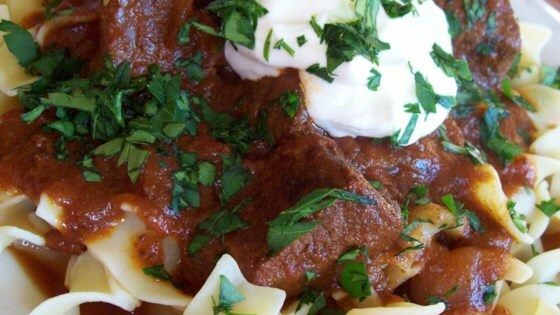 To prepare a day in advance, transfer the goulash to a pot after cooking in the slow cooker and refrigerate overnight. Reheat on the stovetop over medium-low heat until goulash comes to a low simmer, 15 to 20 minutes. The amount of salt in this recipe was corrected by the Staff on 2/18/2009.